In honor of National Chili Day, I’m sharing one of the recipes from Well Fed 2. My husband Dave grew up in Cincinnati, Ohio, and eating at Skyline Chili was one of our food-bonding experiences, early in our romance about 20 years ago. Cincinnati Chili can be endlessly entertaining. First, there’s the double-entendre involved in ordering your favorite toppings. Do you want a 2-way (chili+spaghetti) or a 3-way (add onions)? Then there’s the legend that it was first served in 1922 at a hot dog stand outside a burlesque theater. This chili is different from its Southwestern cousin because of seasonings like cinnamon, allspice, and cloves—familiar flavors for the immigrant cook from Macedonia who invented it. 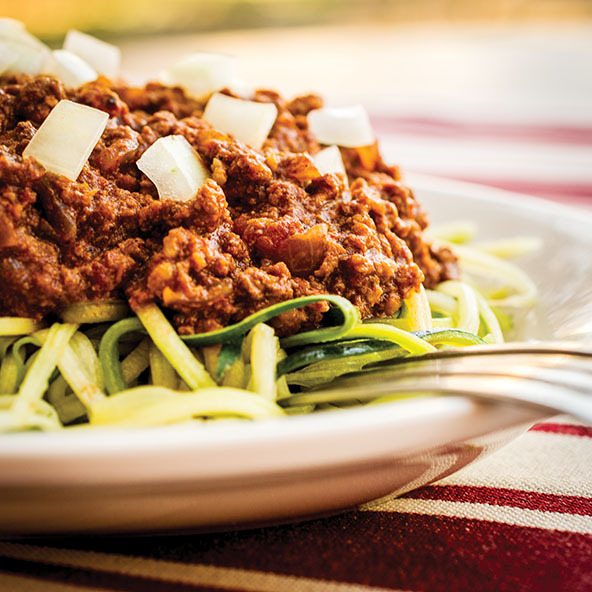 In this version, you get a paleo 3-way: chili+zucchini noodles+onions. If you usually make my Chocolate Chili recipe when you’re hankering for chili, this is a nice change of pace. Place the ground beef in a large soup pot, cover with 4 cups of cold water, and bring to a boil, stirring and breaking up the beef with a fork to a very fine texture. Slowly simmer until the meat is thoroughly cooked, about 30 minutes. Stir in the onions, garlic, chili powder, cocoa, salt, cayenne, cinnamon, cumin, allspice, cloves, and bay leaf. Add the tomato sauce, crushed tomatoes, vinegar, coconut aminos, and 1/2 cup water. Stir to combine. Simmer for 2 hours until slightly thickened. Serve on Zucchini Noodles and top with diced onions. You could replace the beef with lamb. It’s not authentic, but it is scrumptious. You might also pile your chili on top of Roasted Spaghetti Squash. This is hands-down my favourite recipe from WF2 and I make it about once a month. Right on! So glad you like it! I like to put ANY kind of chili on top of plantains. Favorite thing ever. I make this all the time! I made this yesterday. I decided to use the crockpot. I cooked the beef and onions together, put it in the crockpot with all the spices, except the coconut amigos. I was out of it. I substituted a 28 oz can of tomato sauce and a 14 1/2 oz can of fire raised tomatoes. It was fabulous! I served it over an open baked potato. It was loved by all! Great recipe! The cocoa adds a great flavor. Thanks, Melissa! I agree, three way is the only way to eat this! We were in Cinci for just over two weeks and this was my favorite meal! Would love to move to get it every day. Just discovered the site and making something tonight from it.. question on this recipe though. Are you just boiling the beef? Where is it getting browned in this recipe?? For Cincinnati Chili, the beef isn’t browned first. It’s cooked in the water to make it very tender and to create very small granules of meat. That’s one of the things that sets Cincinnati Chili apart from Texas chili. love you for this!! Ahh, midst of a whole30 and this Cincinnati family needed this badly. thanks! This recipe was delicious. However, this is not Cincinnati Chili. I’m not sure it’s even close other than texture. I’m not sure I could even tell you what’s missing, etc. HOWEVER, as I said, very delicious and will get added to our staple dishes! Hi there! I’ve made this a few times now and loved it! Can you tell me how you define crushed tomatoes and tomato sauce though? In my supermarket, they have identical ingredient listings and the only different is that the crushed tomatoes are just a tiny bit more chunky. Any clarification you can offer would be much appreciated! The level of chunkiness is the only difference. They can be used interchangeably in most recipes. This was fanTAStic!! We’ve been eating it for three days straight. 🙂 I made noodles from sweet potatoes and carrots, and just tossed them in the cast iron skillet w some coconut oil for a few minutes. Perfection!! I am allergic to coconut. is it possible to eliminate the coconut aminos from the recipe? Yes, you can just leave them out and it will still taste great. Mel, I used to make your other chili recipe, and I thought it was great. Then I made this yesterday, and I must say I prefer this. Extremely enjoyable with some roasted sweet potato! I had to sub out coconut aminos as they are uber expensive this side of the Atlantic, but used some fish sauce instead. Thanks for all the tasty dino-chow! BTW I finally got around to posting a review on amazon for Well Fed 2! 🙂 This chili was the catalyst. Yeah, it was THAT good. Hooray! Glad you like it. And thanks for leaving a review! I really appreciate it. Happy cooking! This was, hands down, the best chili I’ve ever eaten. I made it for a friend who graciously accepts the role of guinea pig when I’m trying out new recipes and we both sat there groaning and moaning throughout the whole meal. I’m sure that anyone who heard us thought there was something weird going on! This is going to be a regular occurrence at my house as my husband and kiddos told me they loved it as well. Thanks so much for this little gem! I’m a native Cincinnatian and grew up with Cincinnati chili, so I’m looking forward to trying this out. Even if it’s not like the original (sigh), it still sounds good! I hope it was a hit! What is this Skyline Dip you speak of?! Skyline Dip is a big party treat here. You make it by spreading a package of cream cheese in the bottom of a 13×9 pan, then top with a can or two of Skyline chili and then grated cheddar cheese. Stick it in the oven for 15-20 minutes to heat and serve with tortilla chips. Horribly unhealthy but oh, so good! And there’s really no healthy substitute for this. 🙂 But I did try the chili and LOVED it! I’ve made it several times since then and it’s wonderful! I HATE chili, but my husband loves it and I wanted to make him a special dish. I admit I thought boiling the meat was a bit weird, and browned it with the onions before adding the rest of the ingredients. Now seeing that it’s a texture thing, I’ll definitely try it the other way next time. The chili was SOO good, I am glad it produced leftovers. We had it over spaghetti squash and it was a perfect hit-the-spot stick to your ribs meal! Agreed that the boiling thing is weird — but it’s what gives Cincinnati Chili it’s unique (tender) texture and flavor. Enjoy! How do you drain the fat off the ground beef using the boiled method of cooking? I have it simmering right now, but just realized I am not sure how to proceed without leaving all that beef fat in the chili which I’m not really keen on doing. Thanks for the recipe! If you want to remove the fat (I usually use grass-fed beef which is super lean, so no fat to remove), chill the meat. The fat will solidify on the top and you can remove it, then reheat the meat and proceed with the rest of the recipe. You can also do that trick at the end: Make the chili, leaving all the fat, chill the completed chili, and remove the solidified fat from the top, then reheat to eat. I made this for Football Sunday this weekend (@fit_clean_fun on instagram) and my husband recognized it right away! I had no idea he’s had the real cincinnati chili and he immediately asked if that’s what it was. he was so excited- and said it tasted exactly the same! We loved it and will definitely be enjoying leftovers all week. Great recipe! This was fantastic! My Cincinnati-native college best friend introduced me to Skyline many years ago and I love it, but it’s not the healthiest meal. I’ve made a few versions over the years, but this one is by far the best. I’ll be making this again and again. Yes! Any ground meat will work. Enjoy! Do you drain the meat before adding the other ingredients? Thanks for the quick reply. I am loving your cookbooks, I borrowed them from the library and can’t wait to buy my own set. I’m glad you’re having fun with the recipes. Happy cooking! First up I have never made a single recipe of yours that I did not like. Even my anti-paleo husband loves your recipes. Keep it up! Looking forward to your new book (hoping the UK release date is the same!) Quick question, would it be possible to make this in the Instant Pot (pressure cooker)? That’s so nice! I’m glad you and your husband are enjoying the recipes! I don’t have an Instant Pot, so I’ve never tried this recipe that way, but I did a little research. The technique needs to change to accommodate the Instant Pot so the texture of the meat will be a little different than true Cincinnati Chili, but the flavor will be the same. DISCLAIMER: This is a guess on my part. I’ve never used an Instant Pot. Sauté the aromatics: Heat 1 tablespoon extra-virgin olive oil in the pressure cooker over medium-high heat until shimmering, then add the onions and garlic. Sauté the onions and garlic until softened, about 5 minutes. Toast the spices and cook the beef: Make a hole in the center of the onion/garlic mix and add the chili powder, cocoa, salt, cayenne, cinnamon, cumin, allspice, cloves, and bay leaf. Cook until fragrant, about 30 seconds. Add the ground beef and cook, stirring and breaking up any clumps, until the beef just loses its pink color. You want really tiny meat crumbles. Add the tomato sauce, crushed tomatoes, vinegar, and coconut aminos. Lock the lid on the pressure cooker and bring the cooker up to high pressure. (Read your fine pressure cooker manual for how to do this). Cook at high pressure for 20 minutes in an electric PC, 15 minutes in a stovetop PC. Let the pressure come down naturally, about 15 minutes. Made the Cincinnati Chili (used a wee bit less meat, sauteed meat and onions so as to lessen their “impact”). Otherwise everything else was as written. People are following me around at work today, it smells SO GOOD. My husband (who refuses to eat any chili other than “his” recipe) ate a good three servings of it last night. WINNER< WINNER!! Hooray! Glad it was a hit with you and your husband. Chili is a VERY personal thing, so I’m happy he liked it. Do you strain between step 1 and 2? That seems like a lot of water to carry over to step 2 so just checking. Sounds so Yummy! Thanks! Giving it a try tomorrow. So Excited! reliving college days in Ohio, Skyline 4 way and chili dogs. Another winner!